There is very little to write about my two matches today. I won easily, playing well within myself as my opponents were unable to hurt me in any way. 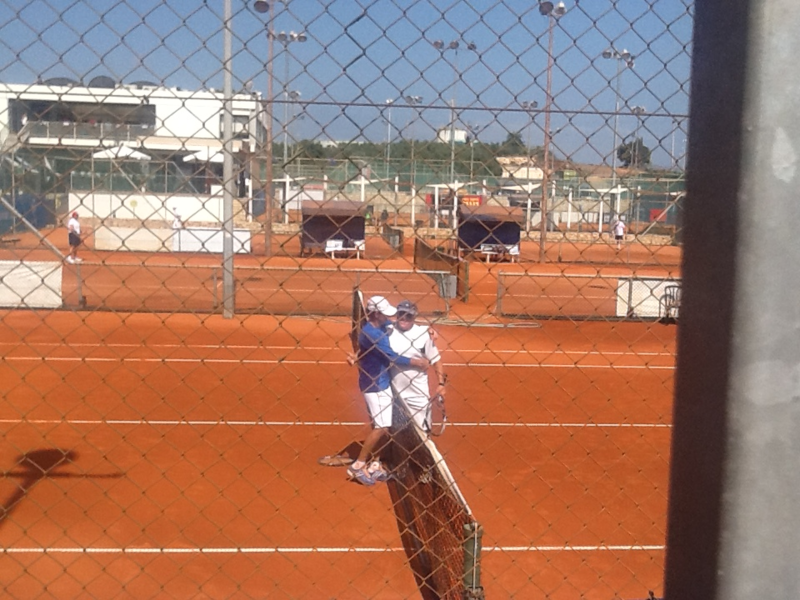 The red clay is slowing the pace down and I can run down any ball. Knowing that to be the case I can play with high shot tolerance, meaning I can put the ball back in play and not have concern that they will be able to hit a winner. I have made so few errors in my matches. Add that into my opponents not being able to hit winners and it is a winning formula. For my five matches in the round robin part of the tournament, I have won 40 games in a row. I have now advanced to the “medal rounds.” The semifinals will be contested on Friday as there are now two days of doubles matches. I am not doing the doubles. My team has fared pretty well. Advancing to the medal rounds in the singles are one 80’s player, two in the 75s, possibly two in the 70’s and two or three in the 65’s. 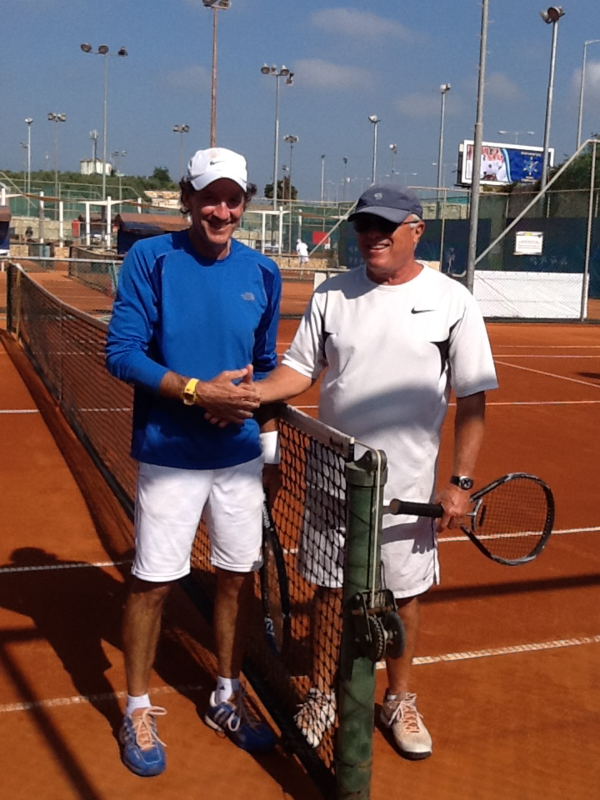 Twenty two of the players will be competing for the gold in doubles beginning tomorrow. Fifteen of our original twenty three didn’t advance. I think that, for many of them, they were shocked that they didn’t do better. They just did not know how hard it is to compete. That there is such a huge difference between playing tennis and competing. For new competitors, there is often a tendency to look at other players and to think that they don’t play well or they just don’t play a good game. The judging a book by its cover runs rampant with new competitors. They are only able to see the outside…if someone looks fit or has a classy game. But there is the invisible, the inside, where the winners and champions live. This is where there is focus, emotional control and strong spirit. There lives commitment, joy of competing, intensity without tension, a welcoming adversity attitude, no quit, belief and presence. I hope that these players who are feeling the disappointment of loss will stay in the game, looking to develop the skills that are necessary to play to their highest level of talents and skills. These skills of are gifts that come from this wonderful game. I have been on this journey for thirty years. For the first four years I could not win matches at the level tournaments in which I competed. Four years of no wins in the first round or the consolation or back draw. I kept working on strengthening the inner unseen skills until I started to get it. And once I got it there was no looking back. And the best part is that these skills made me a better person and helped me in life situations that towered over tennis matches. Winning is nice but it doesn’t last very long. What lasts are the lessons. Great post. So true … The difference between playing and competing. 40 games in a row? That is crazy good. Love it! 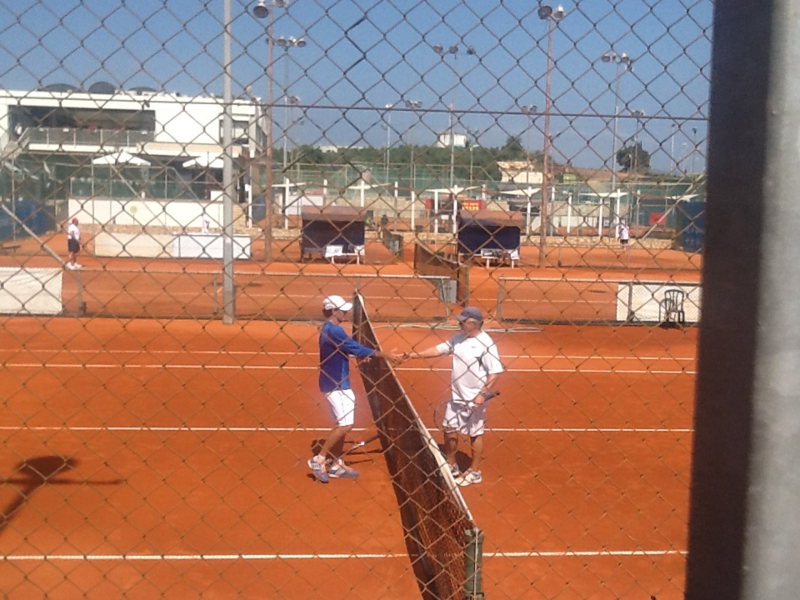 Hello Bob, I had no clue that you were playing on clay. We were on hard courts each time I competed except in Argentina. 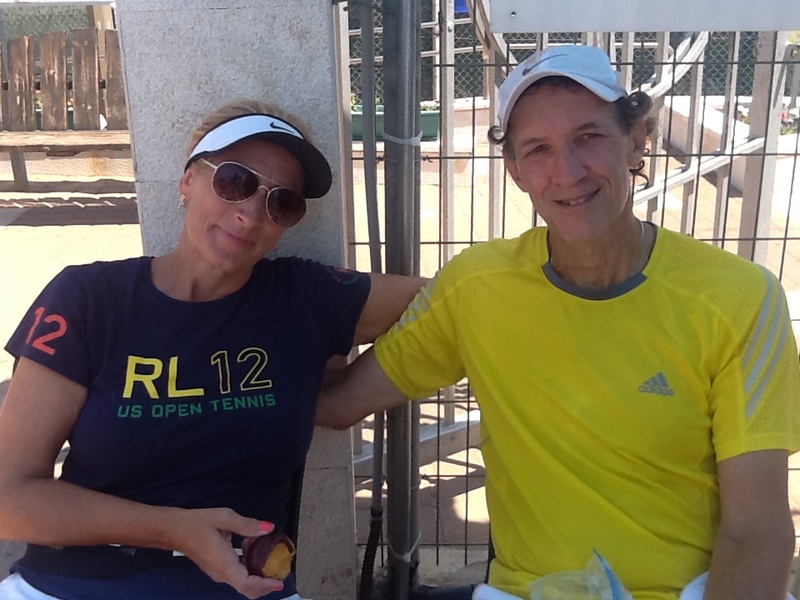 That Israel had hard courts surprised all of us and it meant we did not need to adjust our games. Really, 40 games in a row? Too unreal to comprehend. Even though I’m no longer a competitive athlete, I can still digest your mental approach to competition and see how that improves other challenges that life offers outside the lines. Continued good luck in the tournament. Congratulations…the clay looks magnificent…like your play. Nice photos too. Enjoy your break. Awesome, inspiring stuff Bob- keep it up! P.J. Wow! 40 games….that’s terrific! Congratulations! Love seeing the photos! Thanks for all your updates and words of wisdom. We look forward to your next update! Great stuff Bob – and your comments about the 40 – 0 scores were right on. Keep it up and I am sure the level of play will get better from here on. I love your analogy of how it is problematic when a player judges an opponents level similar to how they would judge a book by its cover. Not a good formula to compete or understand the contents of a book! Super ! that’s quite a record. maintain that focus, and continue on your winning ways. love the insights into your thinking. we are all proud of you.. The authors australia writings is good. I am also a tennis player so I love reading about his experience on the court, it also motivates me to go to the court everyday and work on my game to become a better player. Did you know that surgeries and laser treatments can be avoided by using miracle bust breast growing pills miracle bust. It has the same resutls, if not better, than the surgical methods.